Art exhibitions centered on the relationship between humans and other creatures, The Multispecies Salon 3: Swarm, will open in the St. Claude Arts District of New Orleans on November 13, 2010 from 6 pm to 10 pm and will run through December 5th. Spawned by the annual conference of the 2010 American Anthropological Association (AAA), this year convening in New Orleans, the Multispecies Salon will explore relations between humans and other creatures. Art shows will be installed at three sites in the St. Claude district: The Ironworks, (612 Piety St.), The Front (4100 St. Claude Ave., on November 13th only), and Kawliga Studios (3331 St. Claude Ave.). Coming together in a collaborative venture from the East Coast, the West Coast and New Orleans, six members of a curatorial swarm—Myrtle Von Damitz III, Marnia Johnston, Amy Jenkins, Nina Nichols, Karen Kern, and Eben Kirksey—have brought together a multitude of creative agents. Over seventy artists—hailing from New Orleans, the far reaches of the United States, Europe, and Australia—will animate the shows. A full list of these participants—including internationally acclaimed artists like Kathy High, Adam Zaretsky, and Cornelia Hesse-Honeger—is available online. 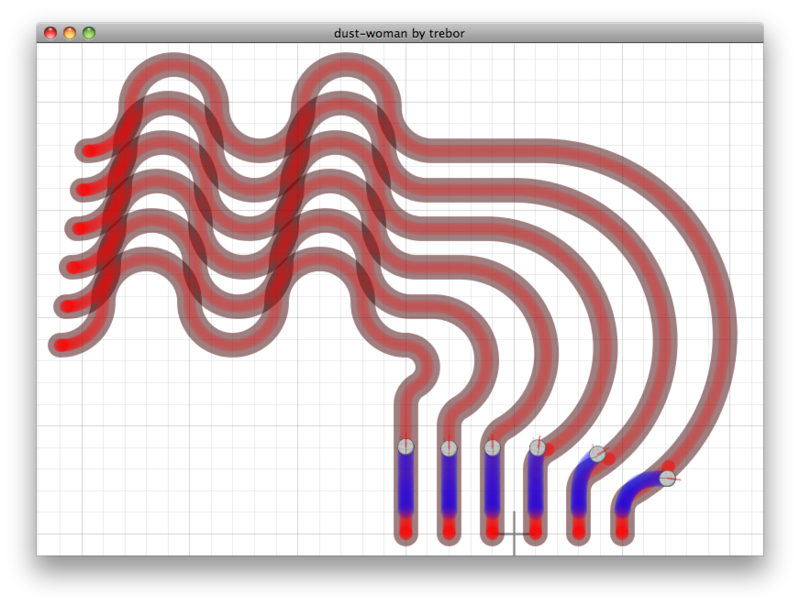 The swarm is a network with no center to dictate order. Swarming is the tactic, rather than the theme, of the Multispecies Salon. Three interrelated themes—orbiting around human relationships with plants, microbes, and animals—will come together in the Multispecies Salon: “Hope in Blasted Landscapes”, “Edible Companions”, and “Life in the Age of Biotechnology.” Hope in Blasted Landscapes will showcase forms of life that persist in post-industrial sites, in the aftermath of disaster. Blurring the boundaries between food and art, we will invite gallery visitors to eat Edible Companions—critters whose bios, biographical and political lives, might provoke a bit of indigestion. Life in the Age of Biotechnology will feature new organisms and machines that have been created by humans or are dependent upon on humans for their very survival. An opening reception will take place at all three gallery sites on Saturday, November 13, from 6 pm to 10 pm, in conjunction with the Prospect 1.5 biennial and the St. Claude Art Walk. The Swarm Orbs, spherical robots that embody the tactics of our show, will be on the move outside The Front Gallery among goats from Pretty Doe Dairy, creatures involved in an urban bioremediation project. Samples from a buffet of edible insects, prepared by Zack Lemann of the Audubon Insectarium, will also be available to visitors. Multispecies Salon events will continue the following week in association with the American Anthropological Association (AAA) conference as well as the New Orleans Fringe Festival, both from November 17-21. Internationally renowned anthropologists will give lectures about human relations with other species, free and open to the public, at Kawliga Studios (6:30-7:30 pm, on Monday, Wednesday, and Friday, November 15-19). Anthropologists will become embedded art critics at the Multispecies Salon—working alongside the curators to help stage and document the events with a live blog. Happenings in art worlds will accompany discussions at the AAA conference about the emergence of a new approach to anthropology: multispecies ethnography. Literally ethno-graphy means “people writing” and conventionally anthropologists have limited their research to human realms. “Creatures previously appearing on the margins of anthropology — as part of the landscape, as food for humans, as symbols — have been pressed into the foreground in recent ethnographies,” write Eben Kirksey and Stefan Helmreich in the November special issue of Cultural Anthropology, the flagship journal of the discipline. The Fringe Festival parade will stop for music and refreshments at the Multispecies Salon—arriving at the Ironworks site at 2:45 pm on Saturday, November 20. A garden party, featuring live music by New Orleans musicians Walt McClements and Alex McMurray follows at the Ironworks that afternoon. 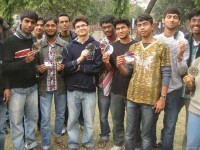 The evening of Saturday, November 20 (6pm-9pm) we will present a free concert by the J.O. Evans ensemble. Cuisine from Louisiana’s swamplands—raccoon, gator, and frog legs—will be on offer from Holly Tamale as concessions throughout the day. Please visit http://www.wix.com/multispecies/multispecies for a full description and schedule of the Multispecies Salon shows and related activities. The Paranioa Bugs—a swarm of small clay figurines by Marnia Johnston, a sculptural embodiment of biotechnology that has gone wild—will populate the Kawliga Studios (3331 St. Claude Ave). 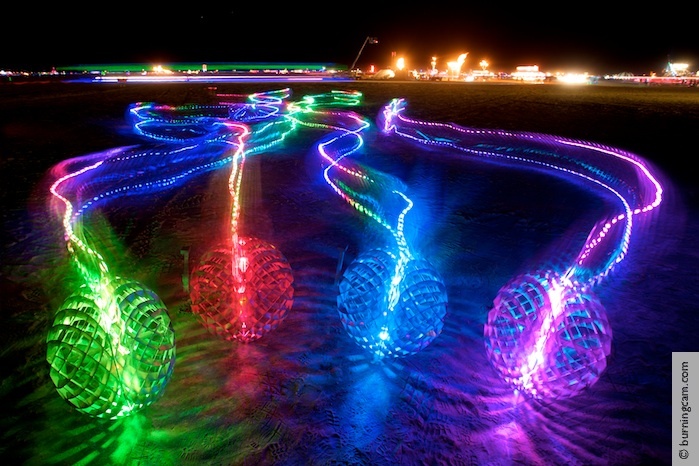 The Swarm Orbs—an interactive group of kinetic sculptures that cost $50,000 to build—will make their debut in New Orleans at the Front Gallery (4100 St. Claude Ave.) on November 13th. They will then visit the New Orleans Marriot for the American Anthropological Association conference. 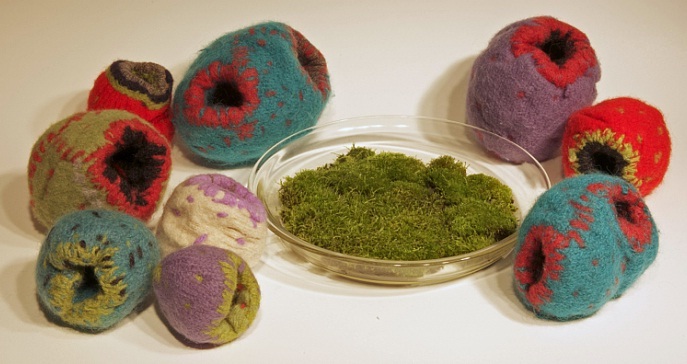 Thneeds Re-seed is a sculptural remediation by Deanna Pindell—a series of small felted habitats, for Bryum argenteum (Silvery Bryum) moss that will be on display at The Ironworks, (612 Piety St.). As the “first responder” in healing deforested areas, these art objects will help mosses establish basic support systems for the diverse species necessary for the restoration of devastated woodlands. The original Thneeds were a commodity in Dr Seuss’s famous children’s book, The Lorax. The orbs breath life into us as we breath life into them! This coming weekend we’ll be making a new push to bring the orbs to the next level with communication, choreography, and autonomy! We’ll be rolling our orbots into the hearts of San Jose-ians (hmm, “San Franciscan” rolls off the tongue… there’s got to be a better phrase ;-) ) on June 5th. 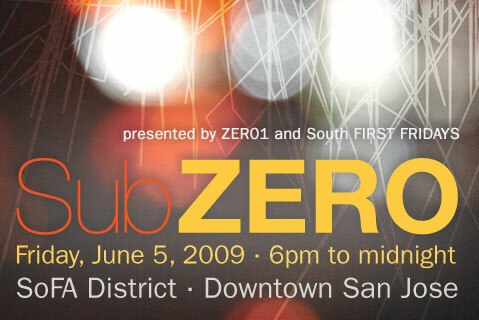 The orbs will be rolling around downtown at the prestigious SubZERO event! ZER01! Building the rolling, singing robotic singularity takes a lot of work, I tell ya! After they’ve taken over, things will be so much easier, I’m sure. In the mean time, you can see SWARM at several events in the coming weeks. We’ll be at the After Hours party at the Google IO Developer Conference this Wednesday, May 27th. This upcoming weekend we’ll be at Maker Faire in San Mateo May 30 & 31st. and then Robogames in San Francisco, June 12-14! 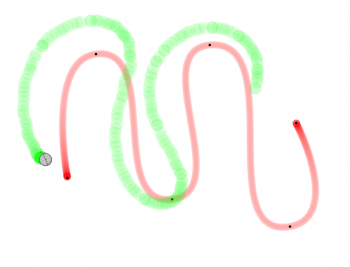 Want to make your own robots? We invite you to stand on our shoulders! After taking in feedback from our entire group, I am pleased to write that the SWARM Project is now completely open source. We had previously put restrictions on commercial re-use of our project. We’ve been lax about posting to the SWARM blog… SWARM gets out way more than you know! Be there or be … round. 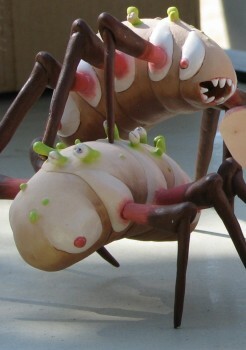 The orbs will be rolling out to Makers Faire in San Mateo. Don’t go to see us, go to see Maker Faire with your family! It’s really a tremendous event. 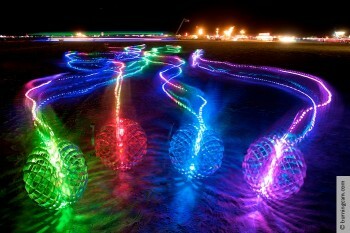 You know what, you -should- go to Maker Faire to see orbs! Here’s a bit more about the Jaunty Jackalope release party! tonight mike and i spent some quality time with orb 2. it went well.